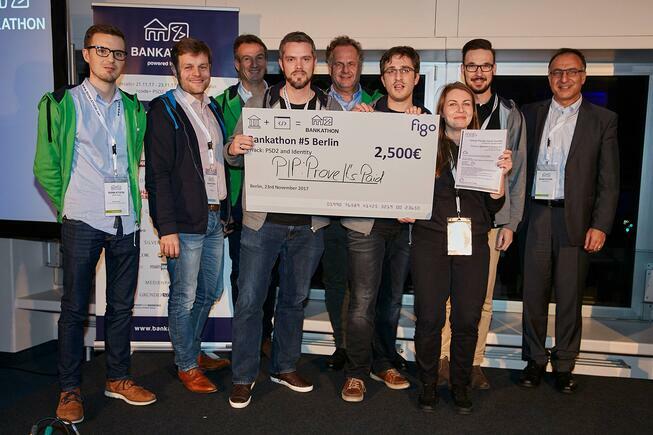 Bankathon Berlin took place in FinLeap HQ on 21-23 November 2017. The key purpose of this year’s event was to show how new regulations in banking, such as PSD2, might affect different industries. Payments Services Directive, known as PSD2, is the new rule that will force banks to provide their coveted customer data to fintech challengers. Not only will the directive disrupt the banking sector, but it can also significantly change the way we obtain sensitive information in other industries. Twenty-one teams from across Europe participated in the event and worked on applications from five different areas (travel, identity, health, insurance, SME). Each team could choose one of them and then build the application that would show the impact PSD2 might have on specific areas. The team worked from 9AM till 3PM the next day – 30 hours straight with no breaks. Our team was represented by Jan Weitzel and Tim Strietzel from CashCape as well as Michal Hartwich and Kasia Iwanska from Netguru. They decided to build an identity-related application. 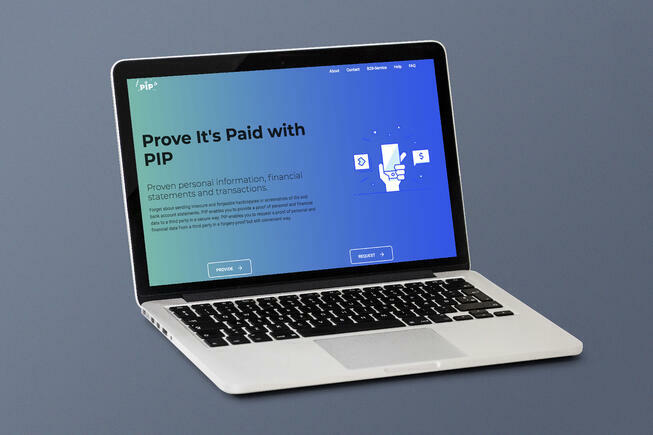 Their idea was to create a product, called Prove It’s Paid, that would collect information about the financial situation of a person who wants to rent an apartment. If a tenant wants to prove their landlord that they are solvent, they can obtain such details from the application through banks’ API without the need to collect documents from distinct institutions and then send them to the landlord. The team used Figo’s and Verimi’s API to complete the projects. They’ve worked really hard with a 6-hour break to get some sleep, and on Thursday evening they presented the concept along with the working product. Their efforts paid off. CashCape–Netguru Team was distinguished with two prestigious prizes. They won Identity category and received the “Bankenverband Special Award” from the Association of German Banks, represented by more than 200 private commercial banks and eleven member associations. The second prize will allow our team to participate in the next Association of German Banks get-together. It’s a great honour and a huge opportunity to learn more about the sector from knowledgeable, experienced specialists and entrepreneurs. 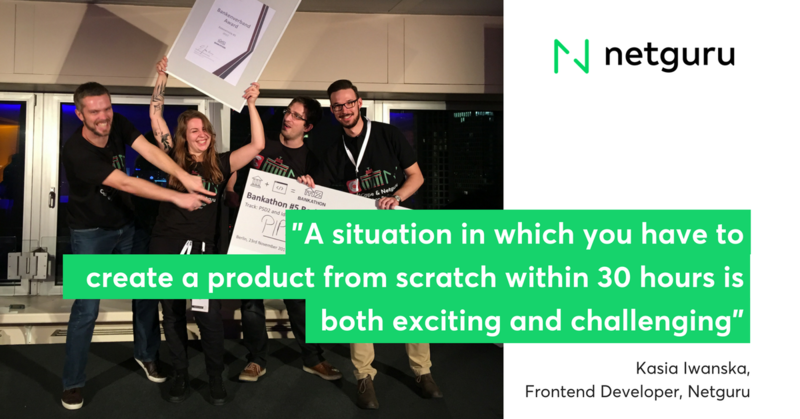 We’re especially proud of our team as the competition also presented great solutions on how to use PSD2 in software. 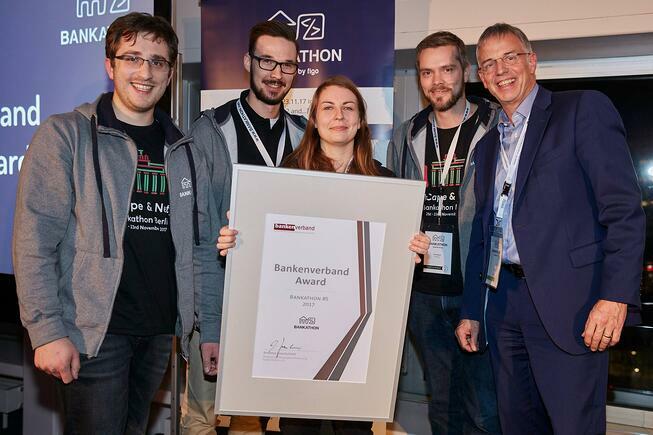 We want to congratulate other participants from our category: Circles, MoCa, RatePAY as well as other teams that took part in Bankathon. Figo, the main organiser of this year’s event, did a great job with logistics planning which involved sponsors and partners who provided APIs for the participants. We were also dazzled by the venue for the hosting of Bankathon participants. FinLeap, Europe’s first fintech ecosystem, made their headquarters available for Bankathon. The participant could enjoy a great view over the city that sparked their creativity and motivation. Figo, Mambu, FastBill, Verimi, Franke und Bornberg, and Visa were the six companies that provided their APIs for the teams. We’re happy to see that big brands are committed to such undertakings and support the community. The past few days have been remarkable for us, and we’re proud to see our developers engaged in such initiatives, achieving great results and developing their skills. We’re definitely up for more events like this shortly.